The 411 on why and how to limit these fats in your diet. Saturated fats. Chances are, nothing good comes to mind when you hear those words. That’s because research has proven again and again that diets high in saturated fats increase LDL (“bad”) cholesterol in blood, which increases the risk of cardiovascular disease. The American Heart Association began recommending in 1961 that we cut back on saturated fat intake to reduce risk. That recommendation still stands almost 60 years later. Fats Defined. When we talk about types of fats, we’re actually talking about the fatty acids that make up fat. Saturated fatty acids differ from other fats in their chemical composition. It’s that difference which causes saturated fats to be solid at room temperature. Think about it—corn oil, a polyunsaturated fat, is liquid at room temperature, butter, a saturated fat, is solid at room temperature. Olive oil, a monounsaturated fat, is liquid at room temperature. Still, that explanation is an oversimplification. The truth is that no oil, no fat, no food consists of a single type of fatty acid. Although one type of fat generally dominates an oil or food, they all contain mixtures of polyunsaturated, monounsaturated, or saturated fats. Saturated Fat Matters. Despite recent headlines that saturated fats may not be as bad as originally believed, the American Heart Association says that clinical trials clearly show that replacing saturated fat in the diet with polyunsaturated fat reduces the incidence of cardiovascular disease. But, there’s more to think about—not all saturated fats are created equal. Some are worse than others for raising LDL cholesterol. Stearic acid, for example, a fatty acid found in foods ranging from dark chocolate to lard, is considered to be neutral, i.e., it has virtually no effect on LDL cholesterol. However, lauric, myristic and palmitic fatty acids, found in coconut oil, palm oil, butter, and lard, clearly raise LDLs and increase your risk. The research on coconut oil is limited. While some research says it increases HDL (“good”) cholesterol in your blood, Penny Kris-Etherton, PhD, professor of nutrition at Pennsylvania State University, points out that there are several members of the HDL family, and the effect of coconut oil on risk may depend on which type of HDL is affected. In the end, keeping track of the good, bad, and ugly among saturated fats is impossible. “Saturated fats should be considered a single entity,” says Alice Lichtenstein, ScD, senior scientist and director of the Cardiovascular Nutrition Laboratory at the United States Department of Agriculture Human Nutrition Research Center on Aging at Tufts University. “Individual fatty acids may differ in biological effects, but people don’t eat individual fatty acids, they eat food containing different types of fat.” The best advice for health is to limit foods with the highest percentage of total saturated fat. Cutting the Saturated Fat. Foods from animals are the chief sources of saturated fat, including high-fat cheeses and meat, whole-fat milk and cream, butter, and ice cream. 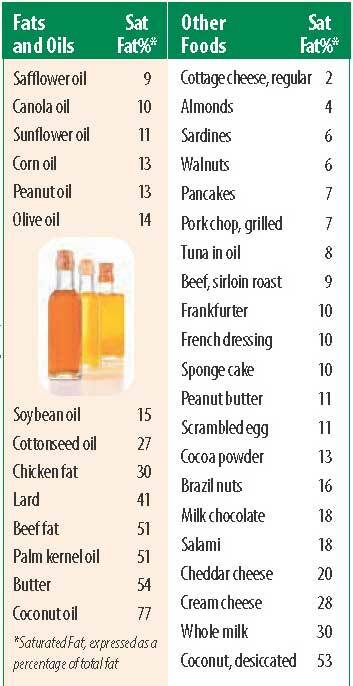 Palm and coconut oils are saturated fats from plants. The American Heart Association recommends that to reduce LDL cholesterol, the diet should be limited to five to six percent of calories as saturated fat. If you consume 2,000 calories a day, five percent of calories means 100 calories a day from saturated fat (about 11 grams). That’s much lower than the 2015-2020 Dietary Guidelines for Americans’ recommendation of less than 10 percent of calories. “Cutting saturated fat by 50 percent is going to be challenging for many people,” says Kris-Etherton. Right now, only about five percent of people in the U.S. have diets that contain less than seven percent of calories as saturated fat. Lowering Cholesterol. Which oil is best for lowering bad cholesterol? “The data are stronger for oils high in polyunsaturated fats, such as soybean, corn, safflower, and sunflower, rather than those high in monounsaturated fat, such as olive oil,” says Lichtenstein. While substituting polyunsaturated oils for saturated fats is best at reducing LDLs, Kris-Etherton points out that olive oil has many natural bioactive components. Both experts agree that using a variety of oils is best. One last tip: Be sure that when you reduce saturated fat in your diet, you replace it with unsaturated fats found in fish, nuts, seeds, olives, and avocados (as well as their oils), not refined carbohydrates like sugar and refined starch. That will actually increase LDLs, along with your risk of cardiovascular disease. Tags aging, bad cholesterol, calories, cardiovascular, cardiovascular disease, chocolate, cholesterol, coconut oil, corn, diet, dietary guidelines, dietary guidelines for americans, food, good cholesterol, hdl, health, ldl, ldl cholesterol, lowering cholesterol, milk, nutrition, nutrition research, nuts, polyunsaturated fat, reduce ldl, reduce ldl cholesterol, reduce saturated fat, refined carbohydrates, sugar.